There's two ways to create new tags in Noko. The first one is the one you'll probably end up using most of the time, just use a new tag when logging time—done! If you need to add a whole bunch of tags, you can do that from the Tags page. Noko will tell you with a little message when you'll add new tags so you can check if you really wanted them (and it's not just a typo). To make a tag unbillable, just add a star "*" (asterisk) to the end of the tag. 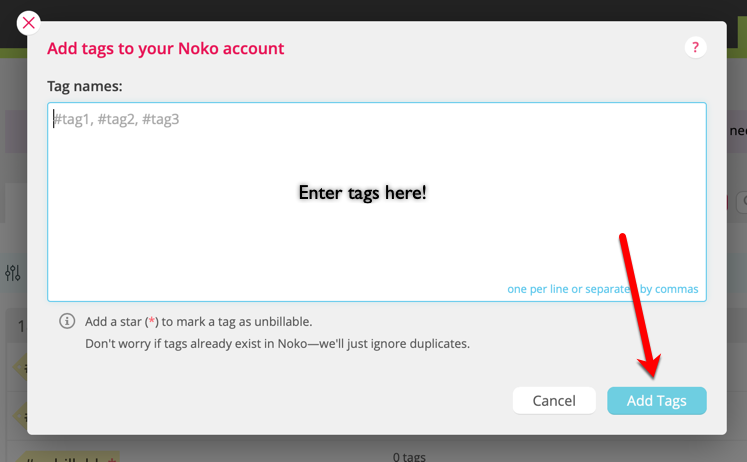 Any newly created tags will be immediately available to all people in your Noko account. This is mostly helpful when you want to restrict tag usage to a pre-defined set of tags. Of course, you can always add more tags, or edit or remove them. Go to Tags in the green navigation sidebar. Enter as many tags as you like, separated by commas or newlines. If you want to create unbillable tags, add a star "*" (asterisk) to the end of the tag name. Don't worry if you enter tags that already exist, as Noko will just ignore duplicates. The newly created tags will be immediately available to all people in your Noko account.